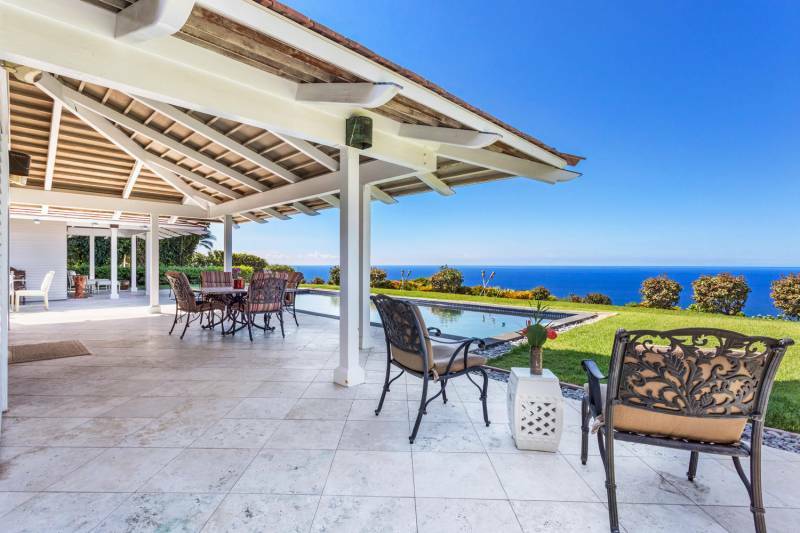 Perfectly situated within one of Kona’s premier gated, luxury communities – Keauhou Estates – this home enjoys panoramic ocean, coastline, and year-round sunset views. The red-tiled roof and white stucco exterior, along with the broad sea views evoke a Cote d’Azure vibe here in paradise. 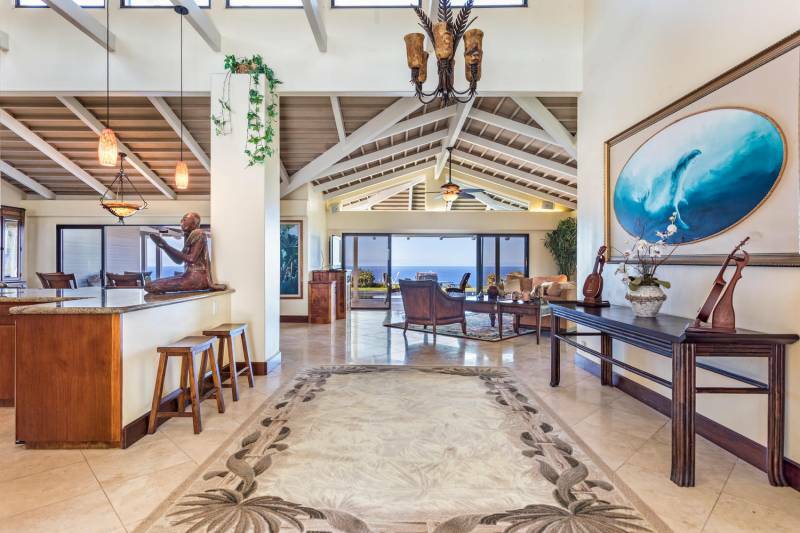 This spacious estate home sits on the slopes of Hualalai Mountain at a coveted elevation of about 800 feet above sea level, where it captures cooling trade winds. With large sliding glass doors and jalousie windows throughout, outstanding cross ventilation and an abundance of natural light is guaranteed. Vaulted ceilings at the entry and in the great room further enhance the expansive, bright and airy feel of this open-floor-plan home. Neutral, attractive — and easy care — polished Travertine flooring is found throughout the interior living spaces, while the outdoor living areas feature unpolished Travertine. The three bedrooms are carpeted for comfort. 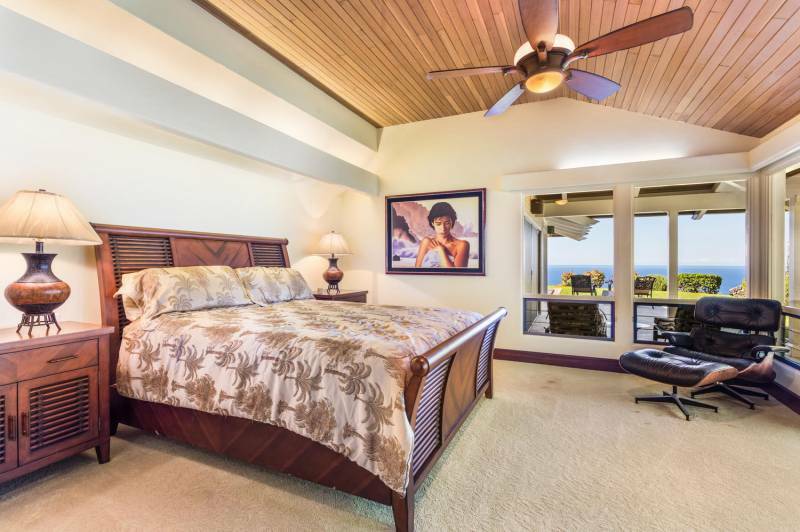 Two master bedrooms with ensuite bathrooms and private lanais are thoughtfully located on opposite wings of the home, ensuring privacy for all. The large guest bedroom with its stunning ocean and garden views is currently used as an office. 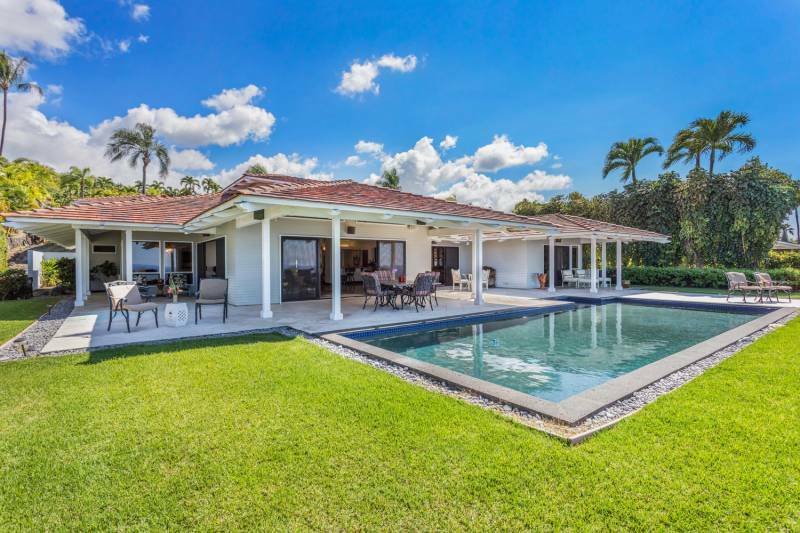 Offering the very best in Hawaii’s treasured indoor/outdoor living, the home boasts covered lanais, beautifully manicured tropical landscaping and a black-bottomed swimming pool. Back inside, the massive, well-appointed kitchen includes refined details such as African mahogany cabinets, granite countertops, and stainless steel appliances. A dream for the home chef and for entertaining guests. The detached, oversized two-car garage offers plenty of space for your vehicles as well as storage space for your recreational toys – golf clubs, bicycles, surf and stand up paddle boards, kayaks and more! Keauhou is a resort-like community just 6 miles south of Kailua-Kona with its many services, shops, restaurants, cultural opportunities and a variety of entertainment options and activities. 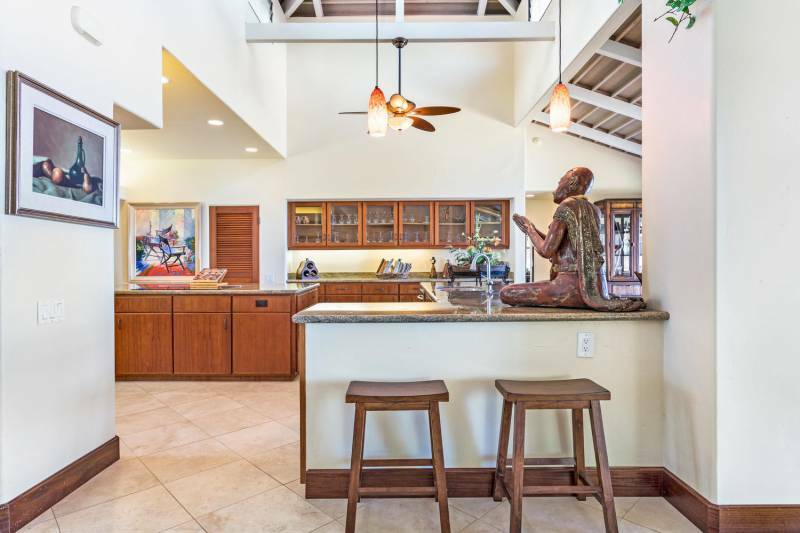 Keauhou Estates is blissfully private, yet conveniently located to the upscale Keauhou Shopping Center, Kona Country Club (with its world-class, oceanfront golf course and dining) tennis clubs, beaches and Keauhou Bay where boating and ocean sports of all sorts abound.